I'm absolutely stoked (and humbled) to be featured in Kelli Watsons new documentary 'We Can Fly', which explores creativity in skateboarding. 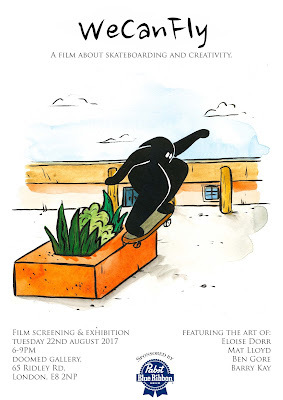 The event at Doomed Gallery in Dalston on 22nd August will feature art works from Ben Gore and Eloise Dorr; bespoke high end furniture designed and made by Barry Kay of Skate Interiors, a spoken word performance from Mat Lloyd as well as the premier of the Short Film version of WeCanFly. The film is available in an interactive format and you will have the opportunity to view the additional parts and profiles of the artists that are featured in this version too. This event celebrates the creativity that is at the heart of skateboarding culture."